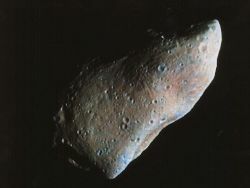 253 Mathilde, a C-type asteroid. This image was taken by the NEAR-Shoemaker spacecraft. An asteroid is a solid object, smaller than a planet, which in our Solar System orbits the Sun. Most asteroids are believed to be remnants of the protoplanetary disc or fragments of larger asteroids. The vast majority of asteroids are within the main asteroid belt between Mars and Jupiter. Studying the sizes, shapes, orbits, and distribution of asteroids, as well as their composition and age through meteorites which came from asteroids, gives us precious information on the early evolution of our solar system. They are precious gifts to humanity so that we can understand our solar system, learn how to avoid their collision with the Earth, and utilize them. Left to right: 4 Vesta, 1 Ceres, Earth's Moon. Hundreds of thousands of asteroids have been discovered within the solar system, and the rate of discovery has been increasing. Each asteroid discovered is given a tentative name, then after at least three sightings and orbit determination, it is given a number, then a permanent name. Current estimates put the total number of asteroids above 1 kilometer in diameter in the solar system to be between 1.1 and 1.9 million. The largest asteroid in the inner solar system is 1 Ceres, with a diameter of about 900 kilometers. Two other large inner solar system belt asteroids are 2 Pallas and 4 Vesta; both have diameters of about 500 kilometers. Vesta is the only main belt asteroid that is sometimes visible to the naked eye (in some very rare occasions, a near-Earth asteroid may be visible without technical aid). The mass of all the asteroids of the Main Belt is estimated to be about 3.0-3.6x1021 kg, or about 4 percent of the mass of our moon. Of this, 1 Ceres comprises 950x1018 kg, some 32 percent of the total. Adding in the next three most massive asteroids, 4 Vesta (9 percent), 2 Pallas (7 percent), and 10 Hygiea (3 percent), bring this figure up to 51 percent; while the three after that, 511 Davida (1.2 percent), 704 Interamnia (1.0 percent), and 3 Juno (0.9 percent), only add another 3 percent to the total mass. The number of asteroids then increases exponentially as their individual masses decrease. Asteroids around other stars than our Sun would be called extrasolar asteroids. Because asteroids are much smaller than planets, detection of them is currently difficult. The distinction between planets and asteroids is not very clear. 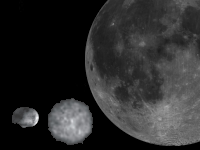 Large asteroids such as Ceres and Vesta could possibly be classified as planets, because they have not been destroyed since the formation of the solar system. Asteroids are commonly classified into groups based on the characteristics of their orbits and details of the spectrum of sunlight they reflect. Many asteroids have been placed in groups and families based on their orbital characteristics. It is customary to name a group of asteroids after the first member of that group to be discovered. Groups are relatively loose dynamical associations, whereas families are much "tighter" and are thought to be products of the catastrophic break-up of a large parent asteroid sometime in the past. 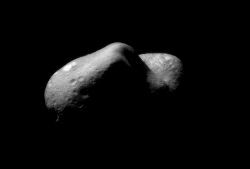 This picture of 433 Eros shows the view looking from one end of the asteroid across the gouge on its underside and toward the opposite end. Features as small as 35 meters across can be seen. This list has since been expanded to include a number of other asteroid types. The number of types continues to grow as more asteroids are studied. Notably, in 1984, David Tholen developed the 15-class taxonomy, which became very popular. Note that the proportion of known asteroids falling into the various spectral types does not necessarily reflect the proportion of all asteroids of that type; some types are easier to detect than others, biasing the totals. Originally, spectral designations were based on inferences of an asteroid's composition, thus giving insight on which asteroids are likely parent bodies of meteorites. Yet, the correspondence between spectral class and composition is not always very good, and various classifications are in use. This has led to significant confusion. While asteroids of different spectral classifications are likely to be composed of different materials, there are no assurances that asteroids within the same taxonomic class are composed of similar materials. The situation may be made worse by the possibility of space weathering, as observed in lunar soils. Space weathering is believed to be at the root of a long-standing controversy that ordinary chondrites, which are the most abundant meteorites, do not seem abundant in the main asteroid belt. Recently, higher-quality telescopic observations, spacecraft explorations, and additional laboratory studies of meteorites have been conducted, leading to greater understanding of space weathering and other effects. These are expected to improve spectral classification and our ability to analyze asteroid composition remotely, thus linking meteorites with their parent body asteroids. 243 Ida and its moon Dactyl, the first satellite of an asteroid to be discovered. Asteroid discovery methods have drastically improved over the past two centuries. In the last years of the eighteenth century, Baron Franz Xaver von Zach organized a group of 24 astronomers to search the sky for the "missing planet" predicted at about 2.8 AU from the Sun by the Titius-Bode law, partly as a consequence of the discovery, by Sir William Herschel in 1781, of the planet Uranus at the distance "predicted" by the law. This task required that hand-drawn sky charts be prepared for all stars in the zodiacal band down to an agreed-upon limit of faintness. On subsequent nights, the sky would be charted again and any moving object would, hopefully, be spotted. The expected motion of the missing planet was about 30 seconds of arc per hour, readily discernable by observers. Ironically, the first asteroid, 1 Ceres, was not discovered by a member of the group, but rather by accident in 1801 by Giuseppe Piazzi director, at the time, of the observatory of Palermo, in Sicily. He discovered a new star-like object in Taurus and followed the displacement of this object during several nights. His colleague, Carl Friedrich Gauss, used these observations to determine the exact distance from this unknown object to the Earth. Gauss' calculations placed the object between the planets Mars and Jupiter. Piazzi named it after Ceres, the Roman goddess of agriculture. 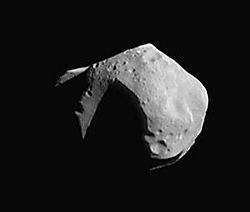 Three other asteroids (2 Pallas, 3 Juno, 4 Vesta) were discovered over the next few years, with Vesta found in 1807. After eight more years of fruitless searches, most astronomers assumed that there were no more and abandoned any further searches. However, Karl Ludwig Hencke persisted, and began searching for more asteroids in 1830. Fifteen years later, he found 5 Astraea, the first new asteroid in 38 years. He also found 6 Hebe less than two years later. After this, other astronomers joined in the search and at least one new asteroid was discovered every year after that (except the wartime year 1945). Notable asteroid hunters of this early era were J. R. Hind, Annibale de Gasparis, Robert Luther, H. M. S. Goldschmidt, Jean Chacornac, James Ferguson, Norman Robert Pogson, E. W. Tempel, J. C. Watson, C. H. F. Peters, A. Borrelly, J. Palisa, Paul Henry and Prosper Henry and Auguste Charlois. Until 1998, asteroids were discovered by a four-step process. First, a region of the sky was photographed by a wide-field telescope. Pairs of photographs were taken, typically one hour apart. Multiple pairs could be taken over a series of days. Second, the two films of the same region were viewed under a stereoscope. Any body in orbit around the Sun would move slightly between the pair of films. Under the stereoscope, the image of the body would appear to float slightly above the background of stars. Third, once a moving body was identified, its location would be measured precisely using a digitizing microscope. The location would be measured relative to known star locations. These first three steps do not constitute asteroid discovery: the observer has only found an apparition, which gets a provisional designation, made up of the year of discovery, a code of two letters representing the week of discovery, and of a number so more than the one discovered one took place in this week (e.g., 1998 FJ74). The final step of discovery is to send the locations and time of observations to Brian Marsden of the Minor Planet Center. Dr. Marsden has computer programs that compute whether an apparition ties together previous apparitions into a single orbit. If so, the object gets a number. The observer of the first apparition with a calculated orbit is declared the discoverer, and he gets the honor of naming the asteroid (subject to the approval of the International Astronomical Union) once it is numbered. 2004 FH is the center dot being followed by the sequence; the object that flashes by is a meteor. There is increasing interest in identifying asteroids whose orbits cross Earth's orbit, and that could, given enough time, collide with Earth (see Earth-crosser asteroids). The three most important groups of near-Earth asteroids are the Apollos, Amors, and the Atens. Various asteroid deflection strategies have been proposed. Two events in later decades increased the level of alarm: the increasing acceptance of Walter Alvarez' theory of dinosaur extinction being due to an impact event, and the 1994 observation of Comet Shoemaker-Levy 9 crashing into Jupiter. The U.S. military also declassified the information that its military satellites, built to detect nuclear explosions, had detected hundreds of upper-atmosphere impacts by objects ranging from one to ten meters across. The LINEAR system alone has discovered 62,283 asteroids as of December 14, 2005. Between all of the automated systems, 3,868 near-Earth asteroids have been discovered including over six hundred more than one kilometer in diameter. Newly discovered asteroids are given a provisional designation consisting of the year of discovery and an alphanumeric code, such as 2001 FH. When its orbit is confirmed, it is given a number, and later may also be given a name (e.g., 1 Ceres). The formal naming convention uses parentheses around the number (e.g., (433) Eros), however, dropping the parentheses is quite common. Informally, especially when a name is repeated in running text, it is common to drop the number altogether, or to drop it after the first mention. The Minor Planet Circular (MPC) of October 19, 2005, was a historical one, as it saw the highest numbered asteroid jump from 99947 to 118161, causing a small "Y2K"-like crisis for various automated data services—up until then, only five digits were allowed in most data formats for the asteroid number. This has been addressed in some data fields by having the leftmost digit, the ten-thousands place, use the alphabet as a digit extension. A=10, B=11,…, Z=35, a=36,…, z=61. The highest number 120437 thus is cross-referenced as C0437 on some lists. Also, the fictional asteroid of The Little Prince, B612, now could be connected with the real (110612) 2001 TA142 which is listed as (B0612) 2001 TA142 in the compacted lists —although it is already present as 46610 Bésixdouze (B612 in hexadecimal translates to 46610 in decimal notation). 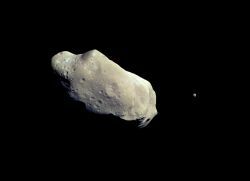 Unnamed asteroids that have been given a number keep their provisional designation, such as (29075) 1950 DA. As modern discovery techniques have discovered vast numbers of new asteroids, they are increasingly being left unnamed. The first asteroid to be left unnamed was (3360) 1981 VA. On rare occasions, an asteroid's provisional designation may become used as a name in itself: the still unnamed (15760) 1992 QB₁ gave its name to a group of asteroids which became known as cubewanos. The first few asteroids were named after figures from Greco-Roman mythology, but as such names started to run out, others were used—famous people, literary characters, the names of the discoverer's wives, children, and even television characters. The first asteroid to be given a non-mythological name was 20 Massalia, named after the city of Marseilles. For some time only female (or feminized) names were used; Alexander von Humboldt was the first man to have an asteroid named after him, but his name was feminized to 54 Alexandra. This unspoken tradition lasted until 334 Chicago was named; even then, oddly feminized names show up in the list for years afterward. As the number of asteroids began to run into the hundreds, and eventually the thousands, discoverers began to give them increasingly frivolous names. The first hints of this were 482 Petrina and 483 Seppina, named after the discoverer's pet dogs. However, there was little controversy about this until 1971, upon the naming of 2309 Mr. Spock (which was not even named after the Star Trek character, but after the discoverer's cat who supposedly bore a resemblance to him). Although the IAU subsequently banned pet names as sources, eccentric asteroid names are still being proposed and accepted, such as 6042 Cheshirecat, 9007 James Bond, or 26858 Misterrogers. Asteroid naming is not always a free-for-all: there are some types of asteroid for which rules have developed about the sources of names. For instance, Centaurs (asteroids orbiting between Saturn and Neptune) are all named after mythological centaurs; Trojans, after heroes from the Trojan War; and trans-Neptunian objects, after underworld spirits. Johann Franz Encke made a major change in the Berliner Astronomisches Jahrbuch (BAJ, "Berlin Astronomical Yearbook") for 1854. He introduced encircled numbers instead of symbols, although his numbering began with Astraea, the first four asteroids continuing to be denoted by their traditional symbols. This symbolic innovation was adopted very quickly by the astronomical community. The following year (1855), Astraea's number was bumped up to 5, but Ceres through Vesta would be listed by their numbers only in the 1867 edition. A few more asteroids (28 Bellona, 35 Leukothea, and 37 Fides) would be given symbols as well as using the numbering scheme. The circle would become a pair of parentheses, and the parentheses sometimes omitted altogether over the next few decades. Until the age of space travel, asteroids were merely pinpricks of light in even the largest telescopes and their shapes and terrain remained a mystery. In September 2005, the Japanese Hayabusa probe started studying 25143 Itokawa in detail and will return samples of its surface to earth in 2010. Following that, the next asteroid encounters will involve the European Rosetta probe (launched in 2004), which will study 2867 Šteins and 21 Lutetia in 2008 and 2010. In September 2007, NASA launched the Dawn spacecraft, which orbited 4 Vesta from July 2011 to September 2012, and has been orbiting the dwarf planet 1 Ceres since 2015. 4 Vesta is the second-largest asteroid visited to date. On 13 December 2012, China's lunar orbiter Chang'e 2 flew within 2 miles (3.2 km) of the asteroid 4179 Toutatis on an extended mission. It has been suggested that asteroids might be used in the future as a source of materials that may be rare or exhausted on earth (asteroid mining). All links retrieved September 13, 2016. This page was last modified on 28 September 2016, at 17:35.